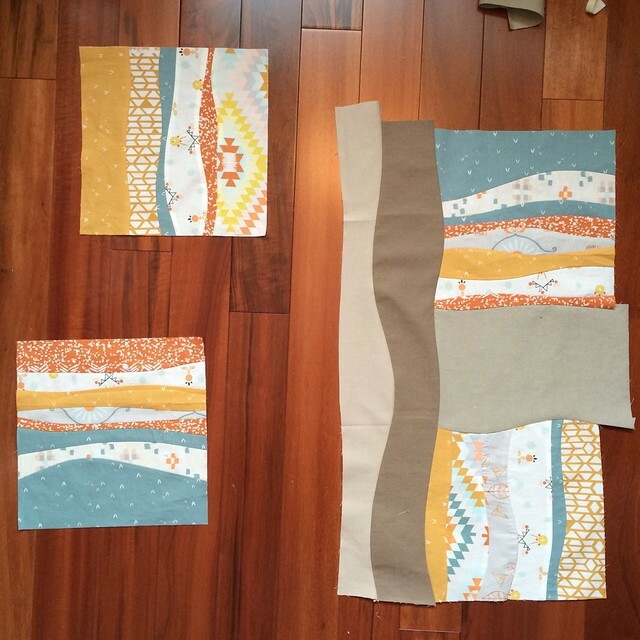 Last night I made 4 more of these nine patches using my Liberty scraps. 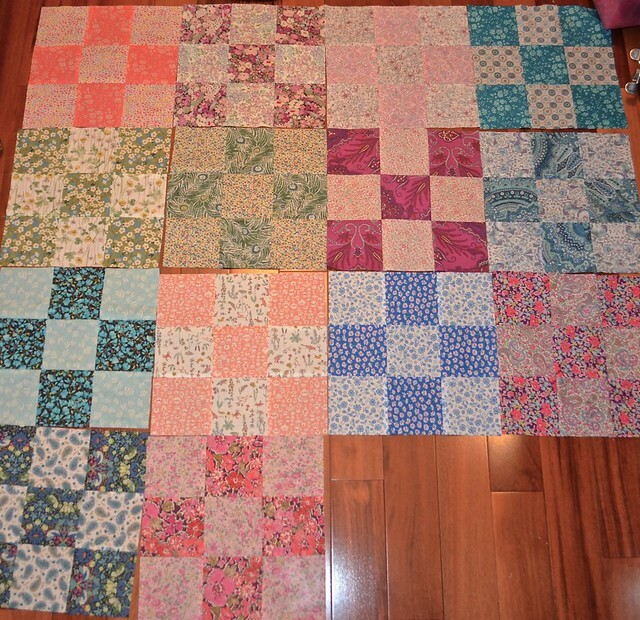 I have no idea how I will put these together in a quilt yet - I have been thinking of making a lap quilt to have at my cottage this summer. By the way, I solved my issues sewing these thinner and tightly woven tana lawn fabrics by buying a set of 70/10 needles which work fine with my 50wt Aurifil thread. The thinner needles seem to glide easily through the fabrics. 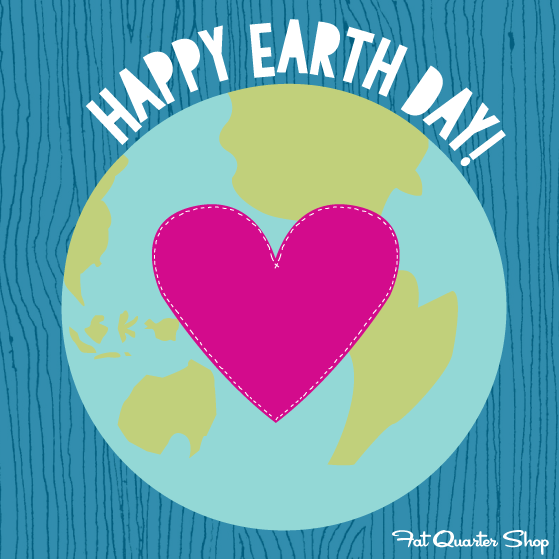 Now its time to announce the winners from the April Scraptastic Tuesday link up. 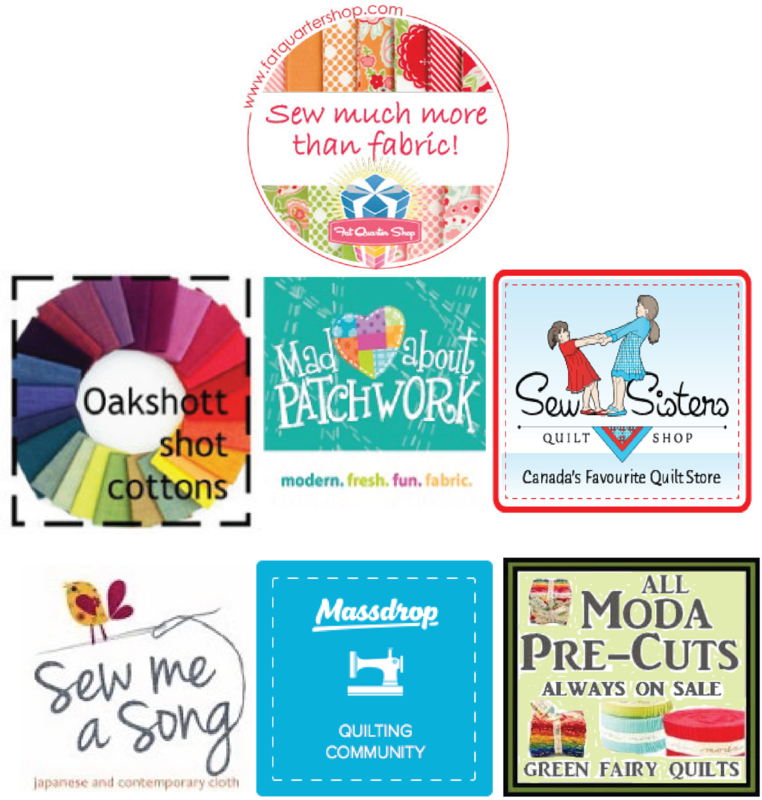 A big thank you to everyone who linked up to join Nicky from Mrs. Sew and Sow and I for April's Scraptastic Tuesday Link Up. You can visit there anytime to check out everyone's projects. We hope you will join us again for the May link up, on the second Tuesday which will be Tuesday May 12, 2015. 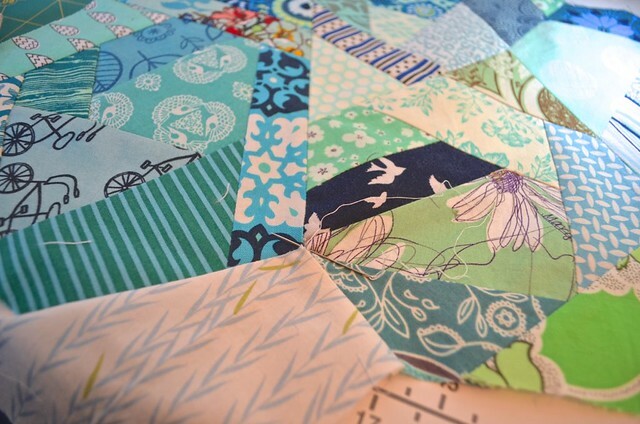 Oh, and don't forget to check out Nicky's post from today, she has been doing some awesome quilting on yet another Siblings Together quilt. 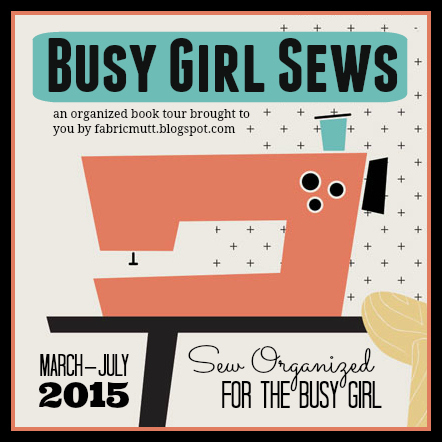 Today is my stop on the blog tour for Heidi Staple's new book Sew Organized for the Busy Girl. 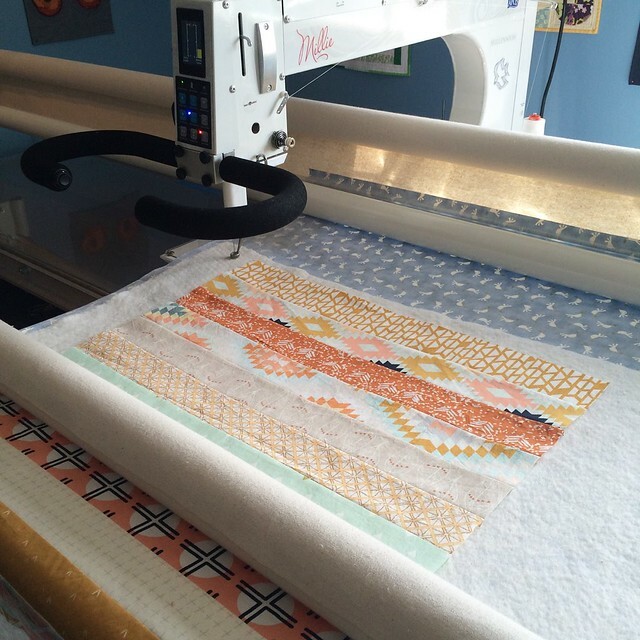 I have been following Heidi's blog Fabric Mutt for the longest time. She is talented and creative so I knew her book was going to be good and it sure is. 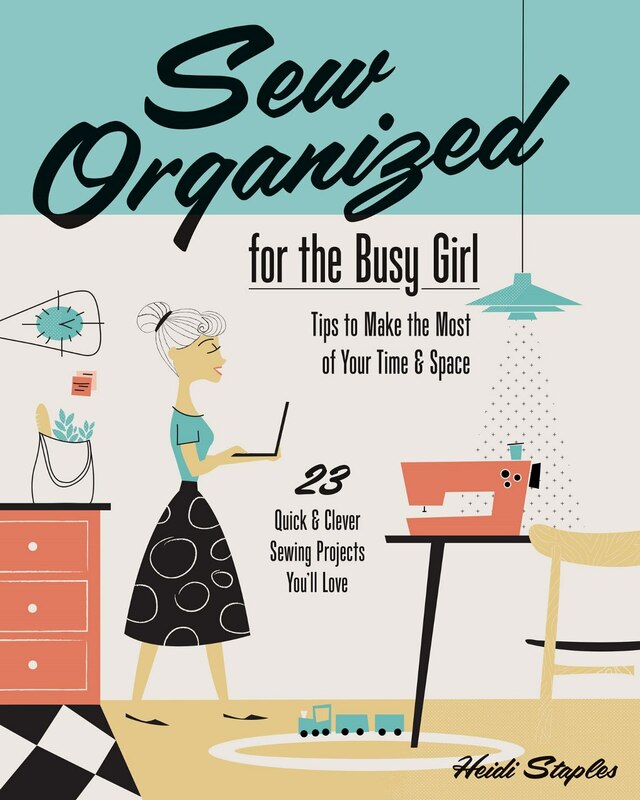 Heidi's book features both tips for being organized to maximize your sewing time and also 23 lovely projects. I love the mid-century modern graphic design of the book too. 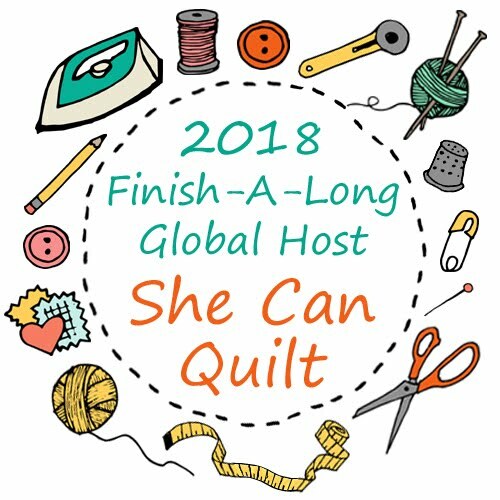 I am still absorbing the tips, from both Heidi and a number of bloggers and friends, about how to use the little sewing time that I have more efficiently - they are excellent ideas. Many of the projects in the book are also designed to make your more organized and I will be making several of them I am sure. 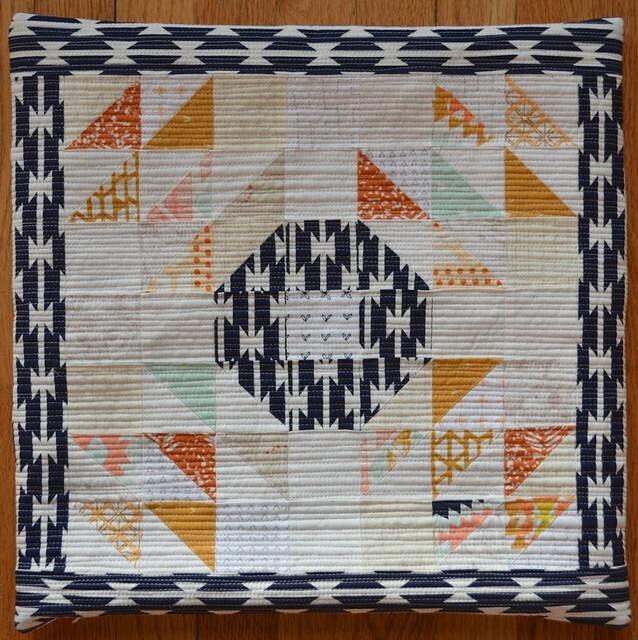 When Heidi asked me to pick a project for the blog hop, I knew I wanted to make the Brass Ring Pillow. 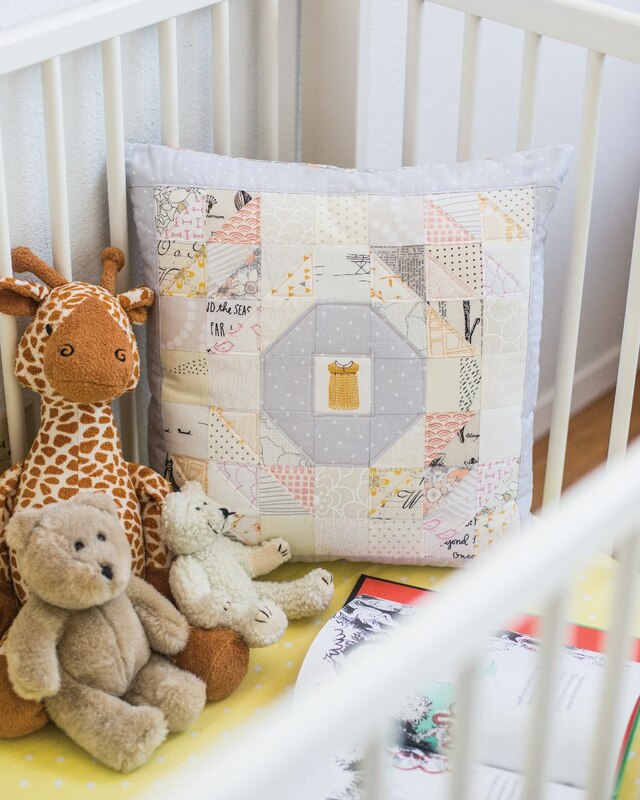 The photo above is from the book - Heidi designed such a pretty understated pillow of light colours and low volume background fabrics, I could not resist it. However, I wanted to make a version that could live in my family room or perhaps with my teenage boys. I've shared work in progress photos of this pillow here and on instagram already. 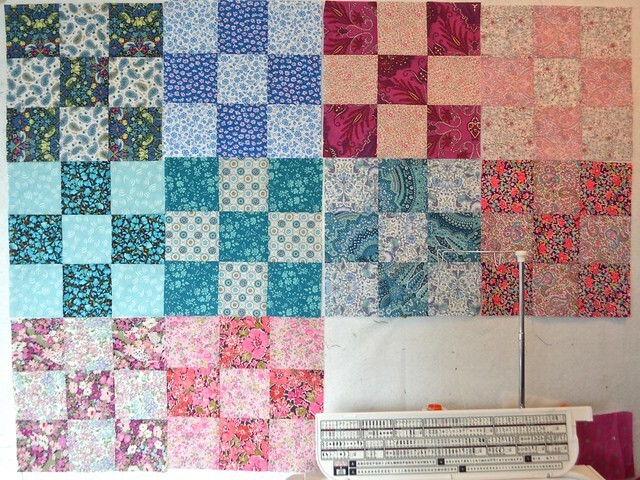 I decided to use fabrics from April Rhodes' lines Wanderer and Arizona and added in several low volume favourites. 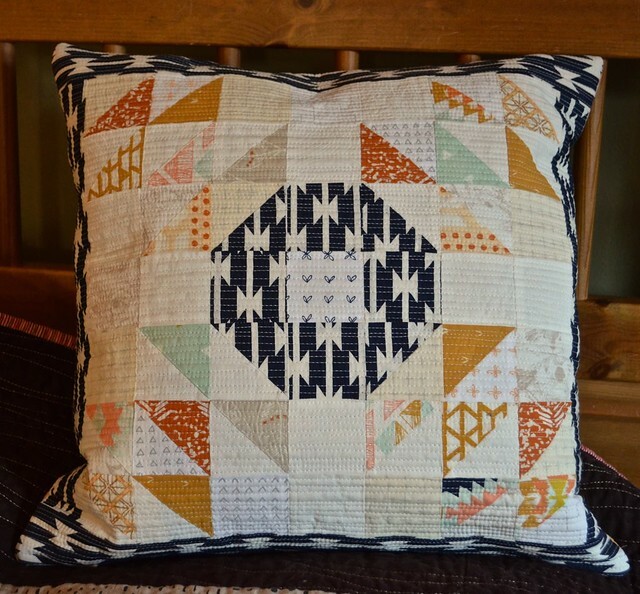 I matchstick quilted the pillow front. I am sure pleased with it - I kept the scrappy low volume design while added a south west flare. 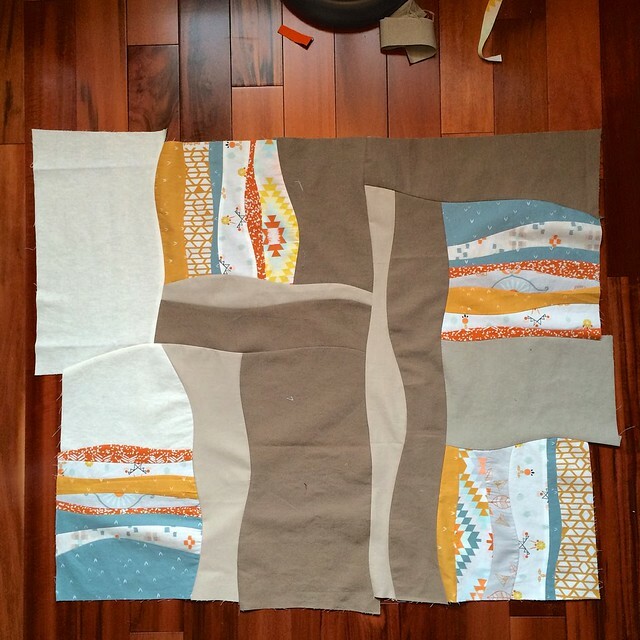 For the back, I pieced strips of the same fabrics and then quilted them with straightish lines unevenly spaced but not matchstick, maybe 1/8" to 3/4" apart. My one adaptation on the Heidi's easy to follow directions was to use an invisible zipper. 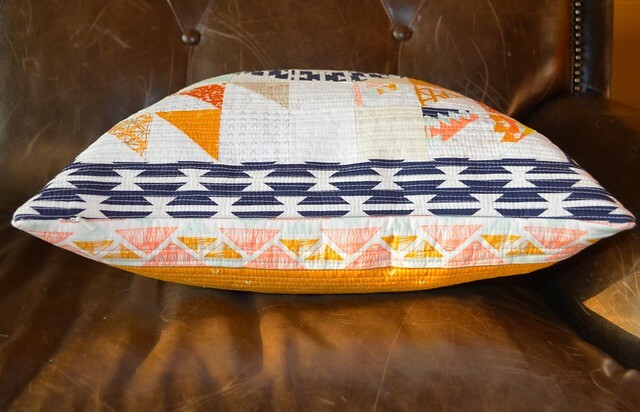 I love the back, it is such a nice compliment to the detailed piecing on the front and adds a bit of colour to this low volume pillow. It is hard - at least for me - to photograph a low volume background so that you can see the prints, so my photos are a little darker than normal to show it off as best I could. Those subtle prints add a lot of interest when one gets closer to the pillow. 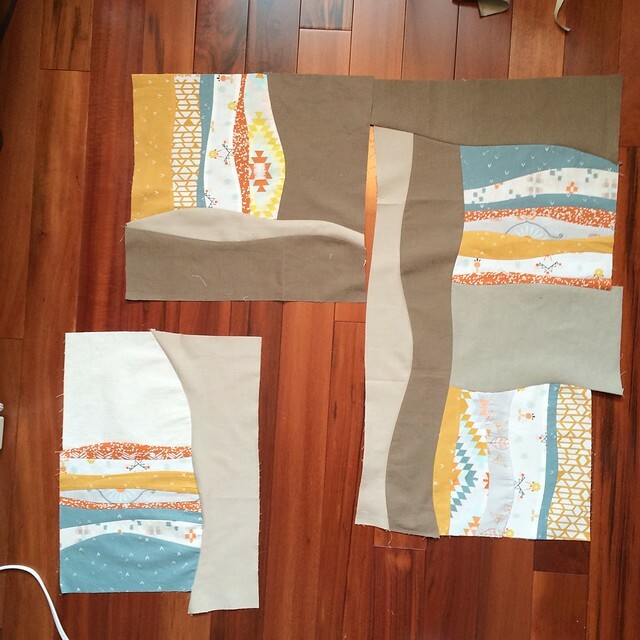 One of the nice things about Sew Organized for the Busy Girl is that Heidi has added several ideas for variations on the patterns. 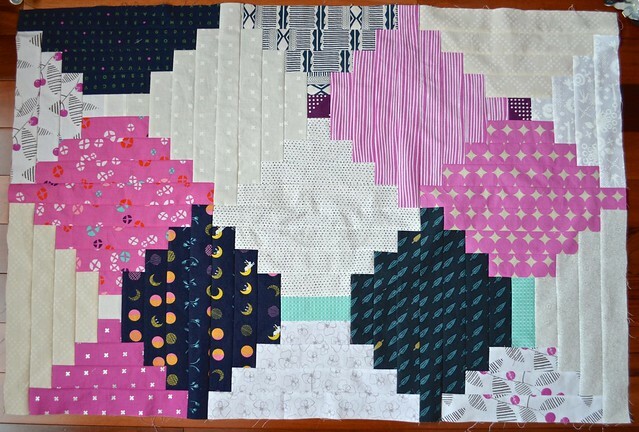 For this pattern, she suggests the cutest baby quilt, and I might just have to make that too, we shall see. After a fairly long hiatus, I was sewing yesterday. Not every day is about a finish at the SCQ Studio (well, it is really an empty bedroom but don't tell). In fact most days are work in progress and I am making an effort to show that more in this space. 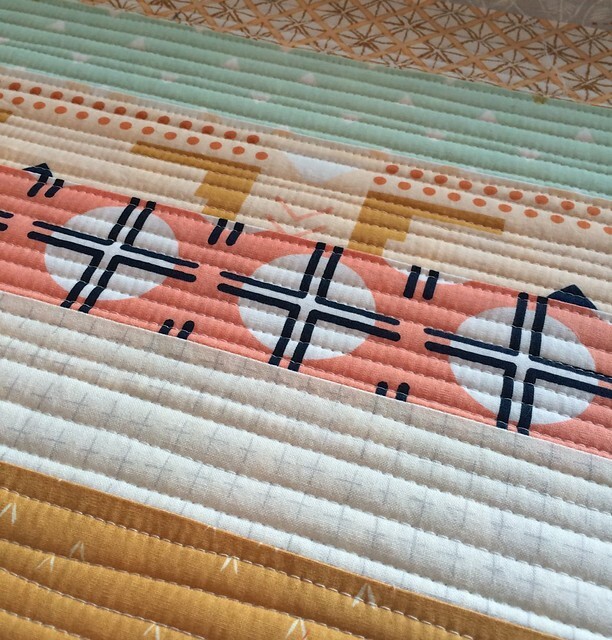 I loaded my long arm with a backing of fabric I don't hate but doubt I will ever use in a quilt - it is perfect for the inside of the Brass Ring Pillow (from Heidi's new book Sew Organized for the Busy Girl). I line my pillow covers so that I can wash them when they get, inevitably, spilled on. 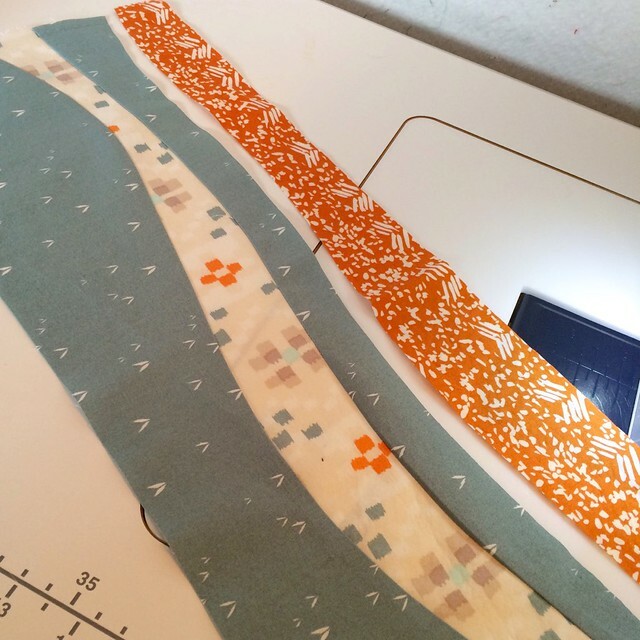 A longarm can easily quilt small and even tiny things, you just need to load a large enough back to roll onto both rolls and then float the piece - I float all quilt tops and batting so this is my usual approach anyway. I used this same back for both the back and the top of the pillow. 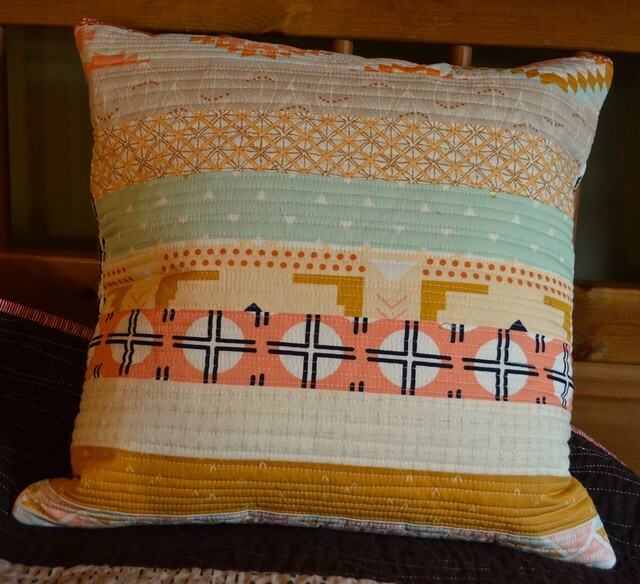 I decided to matchstick the pillow front. 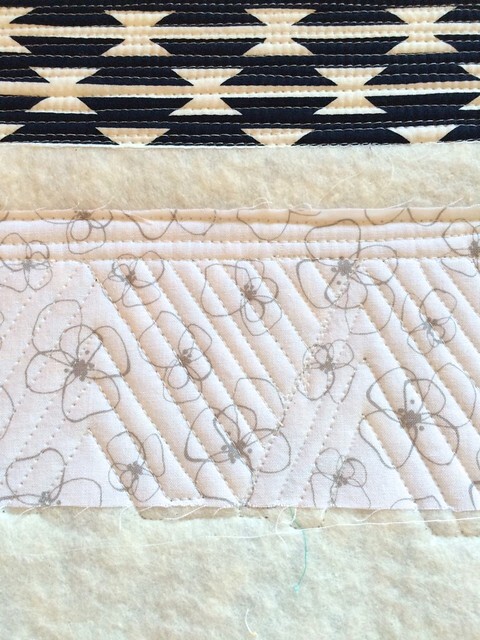 I have to say I still love matchstick quilting the most, even if it takes much longer to do. While I was on the longarm, I grabbed a bit of scrap material and pulled out the ruler base and a longarm ruler to give this another try. I have been watching videos and gathering technique information. This try was much better, I need to practice often. 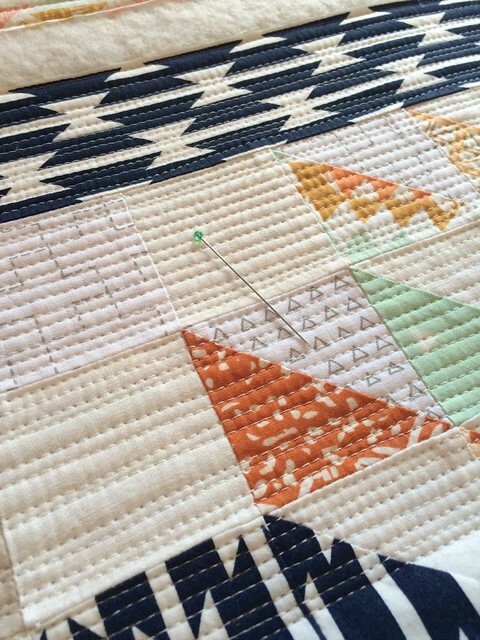 I am a fan of freely drawn lines but the diagonals are not something I can freely draw yet, so learning how to use a ruler is worth it as I do want to be able to incorporate diagonal lines into my quilting too. By the time that was done, and several other things about the house, there was an hour before dinner. With my lovely spouse doing the cooking (he almost always does), I pulled out my scraps to work on my scrappy blobs. This is really a lovely way to play around, I am going to try for at least 10 minutes of this a day from now on. 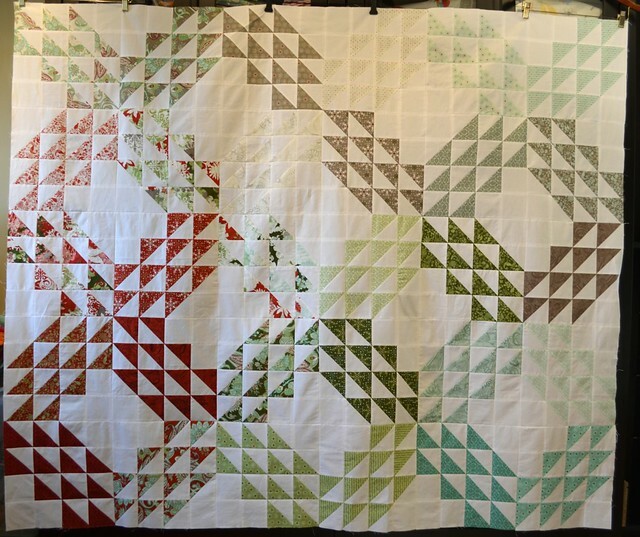 When I pieced a bit onto the blob, there was a Y seam which I did not execute that well. Rather than ripping it out, I just pulled out a needle and fixed it with some hand stitching. Don't forget this option, it saves a lot of time and no one will ever know. Later, I returned to the sewing room, thinking I would play more with the blobs. But a little stack of Liberty fat sixteenth pieces caught my eye - they arrive regularly from Australia, Polka Dot Tea Fabrics has a little club I joined. I had seen a beautiful St. Louis 16 Patch Liberty quilt where the blocks were monochrome lights and darks and the quilt had a variety of colours in it somewhere on the internet in the last week or two (if you know the quilt I mean, please remind me of it's location and maker) and I kept thinking about it often. Well, I decided to try to make my own. 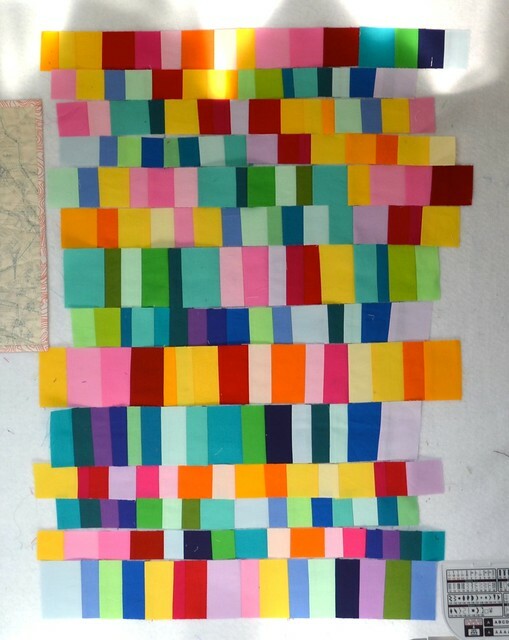 My scraps are not large enough to make the regular size St. Louis 16 Patch quilt you see about the internet and I wanted to have larger cuts of fabric, not tiny 16 patches, so I made 9 patches instead, cutting the fabrics into 4" squares to start. I'm liking them so far, and several got made before bed. The blocks are about 10.5" unfinished. These are so not my normal style, pretty, vintage and scrappy looking but I love them all the same. I am not sure if they will be their own quilt - I certainly don't need another new project but these fabrics just seemed to insist on it. Or maybe I will combine them with the blocks from the scrappy sampler I have been making using Nicky's (Mrs. Sew and Sow) Scraptastic Tuesday Sampler tutorials. That is Sundance. 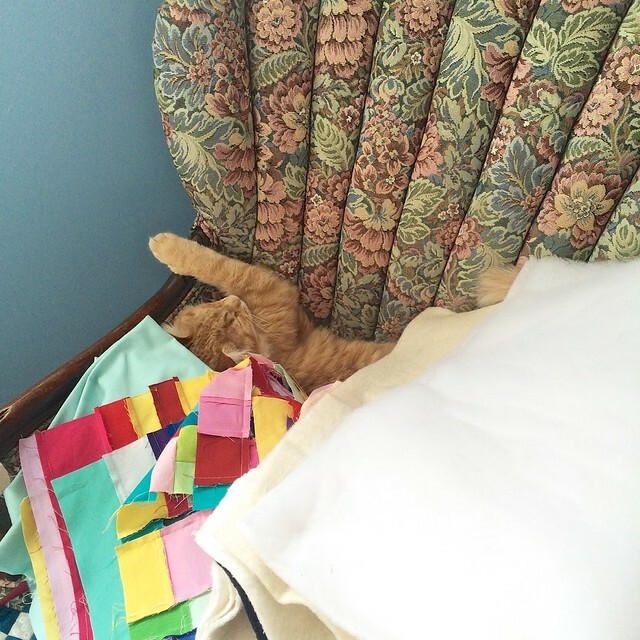 He and Butch are very much crazy torpedo-like teenage kittens blasting about the house, but when he settles he will sleep in this chair that is in the corner of my sewing room. I think I need to find some less precious fabrics to make his tunnel out of for future. 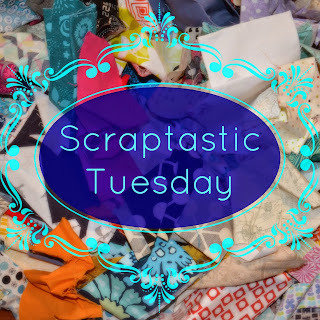 There are only a couple of days to link up to Nicky and my April Scraptastic Tuesday Link, please join us with some progress on a scrappy project or a finish, or your thoughts on taming the scrap mountain. You can link from your blog, flickr, or instagram - there may even be other ways. There are some excellent prizes that I will give away on Tuesday morning and I am going to be checking out the linked up posts and photos today. So please join us by linking up here. 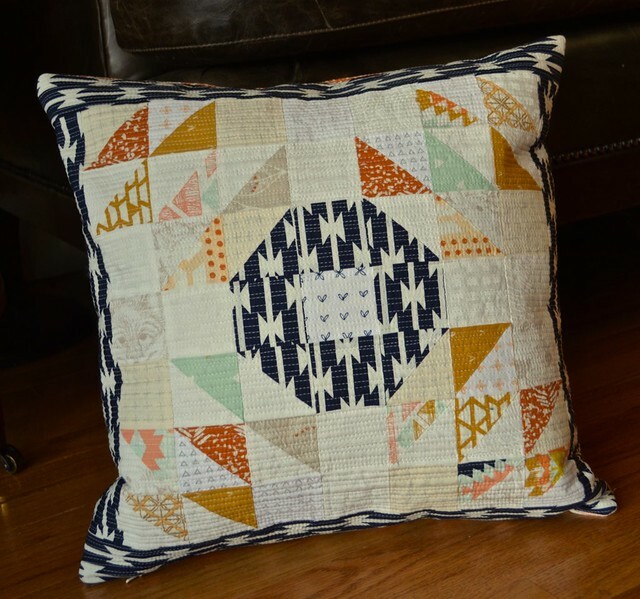 I'll be finishing that pillow today, tomorrow is my day on the blog hop. Welcome to if you're shopping.... On Fridays - late again, it's Saturday morning now - I share news from my sponsors, in case you want to do a little shopping, or even window shopping, this weekend. 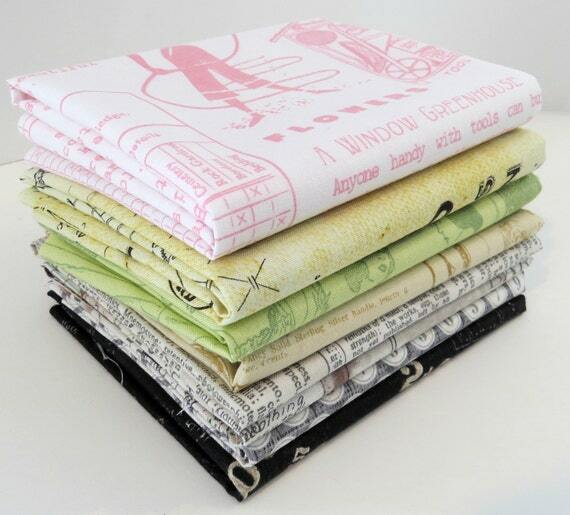 Oakshott Fabrics has released another of their wonderful free pattern booklets! 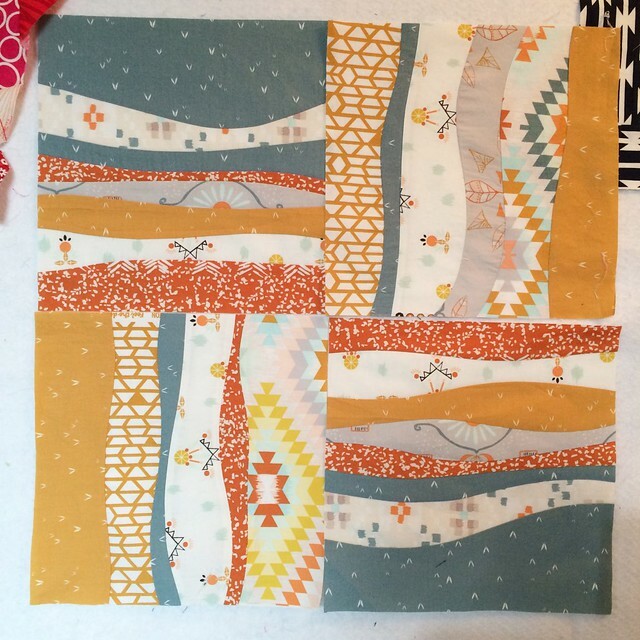 This one uses 10" squares of Colourshott fabrics. 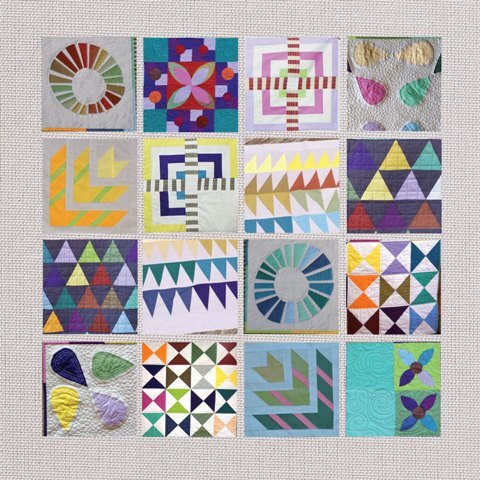 These patterns are all by talented bloggers, in a project coordinated by my friend Lynne from Lily's Quilts. 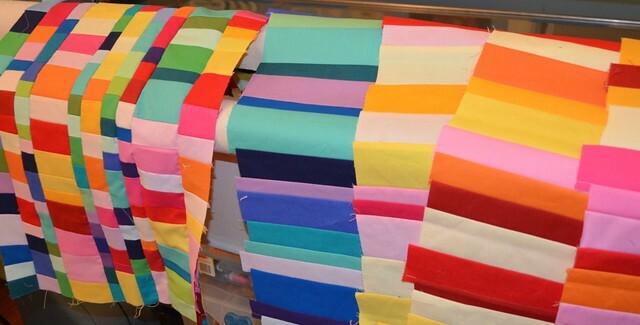 Fabric Spark keeps getting new fabrics, including this bundle of Lizzy House mini bracelets. Fluffy Sheep Quilting has beautiful fabrics and Pearl Cotton too. 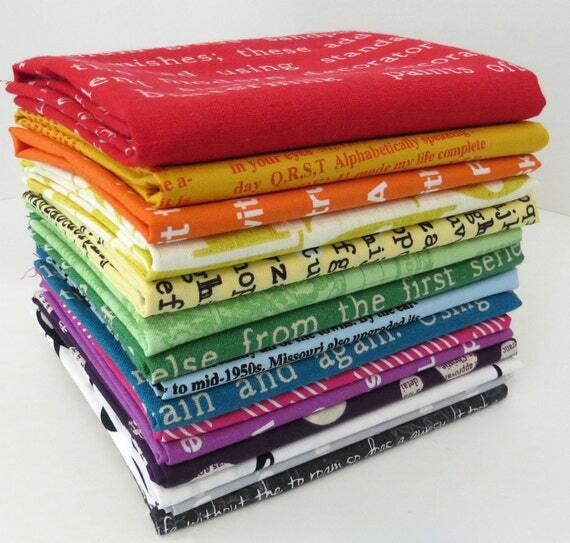 Sew Me a Song is spring cleaning and besides her sales, Becca keeps making beautiful bundles. This one especially caught my eye. 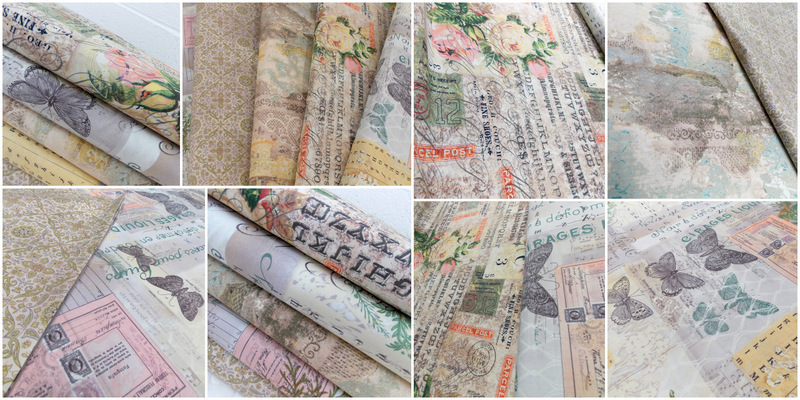 Just in at Sew Sisters Quilt Shop: Tim Holtz Eclectic Elements Wallflowers! 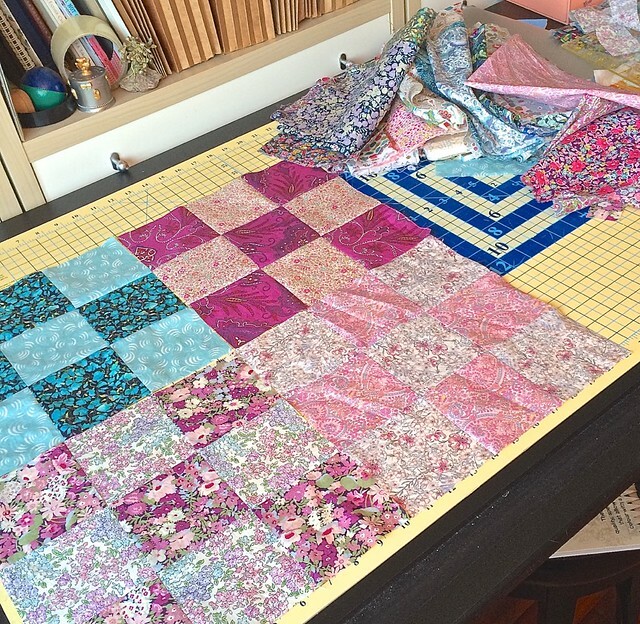 The Fat Quarter Shop is featuring this pretty Petal Pathway Quilt Kit, I just love the colours. 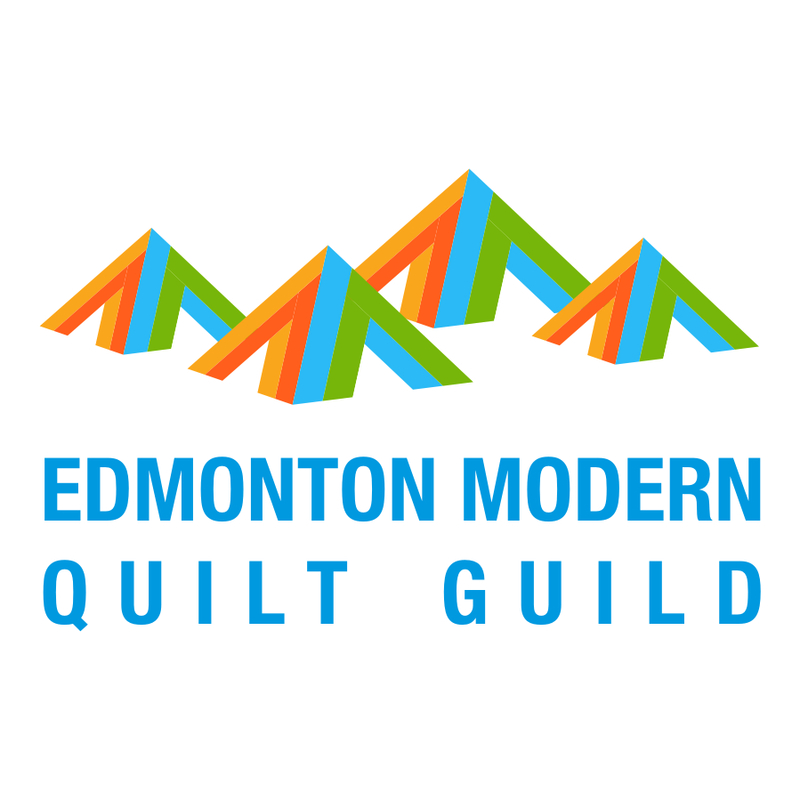 At Green Fairy Quilts there is a big sale: fat eight bundles at 35% off, Bella Solids Junior Rolls at $14.30, Bella Solids Junior Cakes at $14.30, Mini Charms at $3.29, Honey Buns at $19.88, Quilt Kits and Bag Kits at 35% off and Turnovers and Slices at 40% off! Happy 7th Anniversary to Mad about Patchwork! In celebration, this week only (to April 22) they have some fantastic fabrics on for $6 per yard. Don't forget to join Nicky and I for the April Scraptastic Tuesday Link Up - go here. 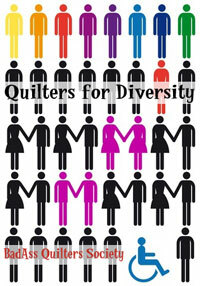 I am going to sew and walk and enjoy a day off today. As some of you have noticed, I have been travelling for fun and mostly for work a lot these days. It means less time sewing. 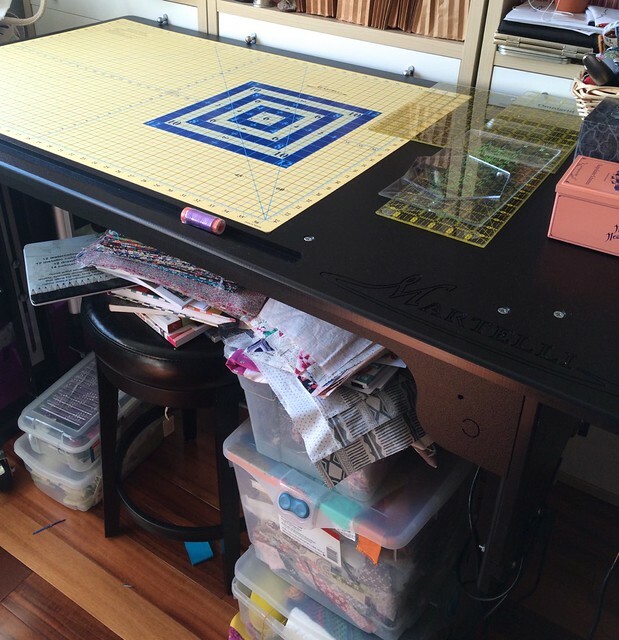 On Sunday morning, I spent a long while tidying up my cutting area and I even dusted it off. It rarely looks like this. Those boxes underneath are various quilting projects in progress. 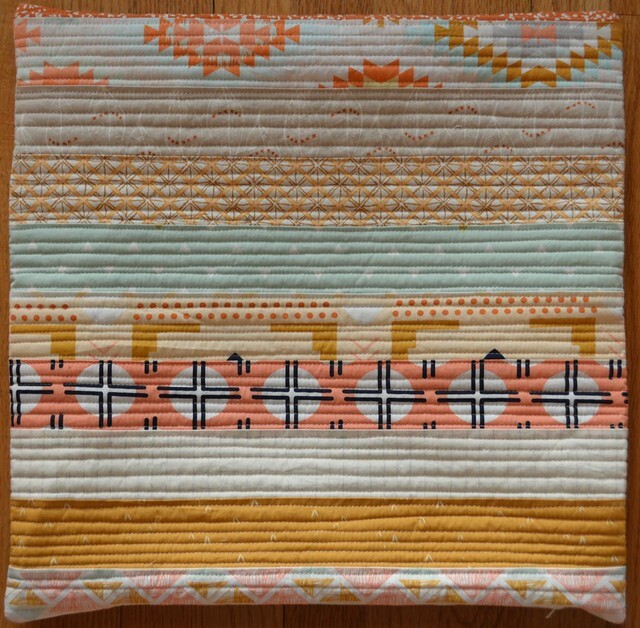 Despite all those projects, I was drawn to the scraps left over from the pillow top I told you about last time and so I just decided to spend some time playing with them. I made some curves. Then I chopped the curved bits into blocks and added a few more and trimmed them up nicely. These look good but I felt pretty ambivalent about them. So I went in search of some dark grey solids. There were no greys about but I found a pile of beachy tans, taupes and browns linen and cotton chunks. Some were scraps, some were larger uncut pieces. I added some of those. And some more, with no plan at all really. By the time I got to here I was unsure about it and I did not like how those lightest bits of linen join in a non curvy jog. I did cut through that join and add a bit more solid but I have no more photos. I need to take a fresh look at the whole thing and decide what to do with it. The point, however, is that I had a great time playing with my scraps. 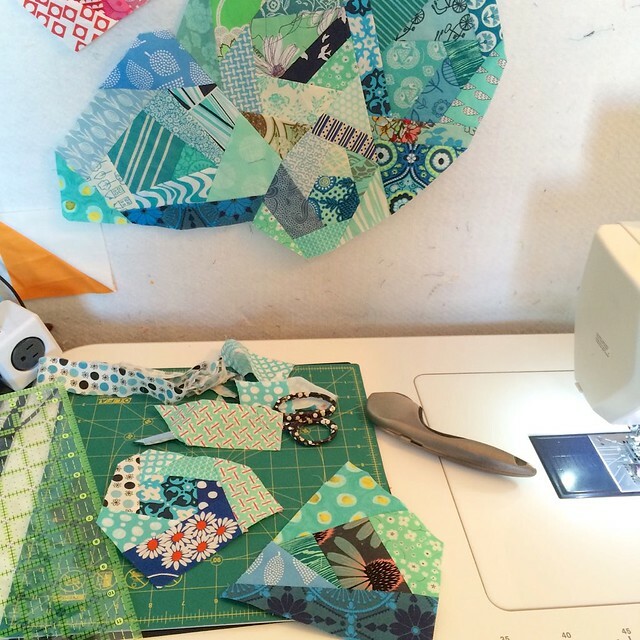 There is no risk in piecing them and then cutting them up and piecing them some more. These are the left over pieces and if the result is not appealing, I can just slice them up to be more scraps. And the time spent, just sewing and playing around - well, it was relaxing, and fun which is the whole point of a hobby. It's not just about the finishes. I'm looking forward to seeing what you have been doing. 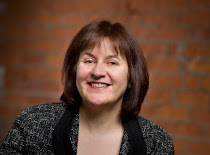 Nicky pointed out this morning that we have been hosting this link for 7 months now, can you believe it? I sure hope you are enjoying it as much as we are.